Hand-cut cardboard signs taped onto sturdy wire stand on Melissa Michelson’s lawn. 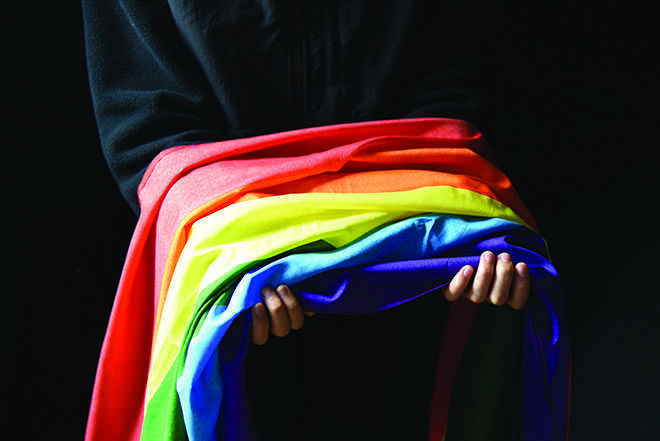 A professor of political science at Menlo College, Michelson researches about and advocates for transgender individuals’ rights. The impact of Trump’s actions has traveled across the nation from a federal level to the Palo Alto community, specifically impacting Britney, a transgender Palo Alto Unified School District fourth grader who transitioned from male to female, as well as Thao Nguyen, a transgender Palo Alto High School graduate who transitioned from male to female. On Feb. 22, 2017, Trump rescinded former president Barack Obama’s bathroom law, which mandated federally funded schools to allow students to use the bathroom of their identified gender. Instead, the Trump administration will allow states to decide whether students should be allowed to use the restrooms of the genders they identify with. Michelson, who has two sons in the PAUSD, states that forcing transgender people to use the bathrooms of their birth gender makes them victims. Although California will not be impacted by this law, other states will. Because of this, Verde met with some transgender individuals and their family members. They spoke about their personal stories on their transitions and about the impacts of their child’s transition. As with many people, the changes for Britney started in her early years. Britney, a PAUSD grade schooler, has looked up to her sister Kerry since she was two. Britney, whose name along with Jillian and Kerry’s has been changed to protect their identities, was young when she began to understand her gender. Because of this, as Britney tells her story, Jillian helps fill in some events that Britney can’t remember well. Britney was born a male, but identifies as a girl. However, when she was two and still identified as a boy, she would try on her sister’s dresses. Jillian and her husband didn’t think much of it because they thought little kids always experimented with dress up and other games. However, one day Britney said something to her father that Jillian never forgot. Jillian says she and her husband just want Britney to be happy. They paid attention to Britney for a while, and she would dress in girls’ clothes, such as nightgowns and dresses. “In preschool she still wore basketball shorts and t-shirts from the girls’ department,” Jillian says. As Britney grew up, she began to vacillate between identifying as a boy or a girl. Over the course of kindergarten and first grade, she would wear both dresses and shorts and she grew her hair long. People weren’t sure of her gender. When kids at school called Britney a boy, she corrected them with the “she” pronoun. In other instances, Britney would corrected her peers with the “he” pronoun. Once Jillian read a book on transgender individuals, it clicked for her: she realized Britney was transgender. “This doesn’t make sense. I didn’t feel like a boy, I felt like a girl,” Britney says. Jillian says Britney is more nonbinary, but Britney says that if she had to choose, she would identify as a girl. “But if there weren’t, I’d be like, I’m neither, or I’m transgender,” Britney says. Jillian says the difference for Britney was that the way Britney talked about being a girl was different than how other girls talked about being girls. Her kindergarten teacher observed the difference in identity and talked to Jillian about it. “Her kindergarten teacher said … Britney in class would talk about … birthing a baby and creating a life, and the teacher said it was different than any of the other girls,” Jillian says. When Britney was in second grade, she decided to change her pronouns. Jillian emailed Britney’s teacher after winter break, to see if the teacher would be willing to try a pronoun change. The teacher obliged, and during class, Britney introduced herself as a girl. According to Britney, everything went smoothly. Another issue, however, was Britney’s name. Britney changed her name in the beginning of third grade. Her birth name was still on official documents, such as grades and attendance forms, because Britney’s family hadn’t legally changed her name yet. The school district was supportive of Britney. Jillian went to the PAUSD District Office and talked to a woman in the welcome center about changing Britney’s name and gender, who was very helpful. Jillian filled out the form, and the woman uploaded the changes to a computer. Ever since then, anything official printed out from her school has Britney’s name instead of her birth name. Prior to her pronoun change, when she was still in kindergarten, Britney had several issues with which bathroom to use. She dressed like a girl, but still identified as a boy. Still, using the boys’ bathroom made her uncomfortable. Jillian refers to her daughter’s experiences with bathrooms when she talks about Trump’s bathroom letter. The message, according to Jillian, is that it is not okay for transgender people to be who they are. Additionally, the issue is one of equity and safety. However, despite everything that’s happened, Jillian is optimistic. 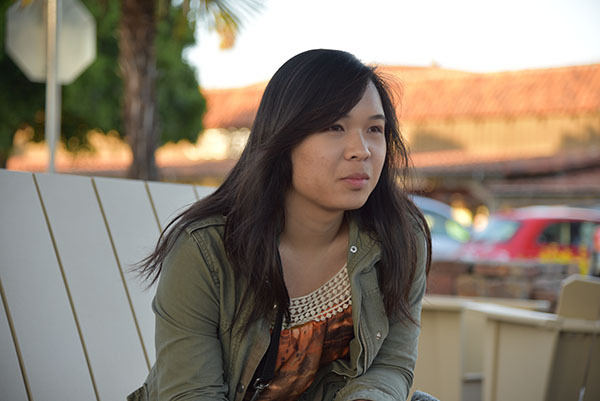 Thao Nguyen, a transgender woman, remembers her experiences as she sits outside Peet’s Coffee and Tea in Town and Country Shopping Center. We met Thao Nguyen at Peet’s Coffee and Tea in Town and Country, directly across the street from her alma mater, Palo Alto High School, where she graduated in 2012. Born male, Thao transitioned to a woman in her earlier years of college at Brown University. Although her transition is recent, she always knew that the transition was bound to happen from the time she was young. This feeling of uncertainty continued until her sophomore year at Paly. Nguyen read a book portraying a transgender woman as a normal person, which starkly contrasted from the media depictions of transgender people as “trapped and disgusting,” she says. Nguyen worked to support herself throughout her transition. Nguyen’s transition also involved realizations regarding the way society treats individuals of different genders. Currently, as a software engineer at Square in San Francisco, Nguyen notices differences in the way women and men are assessed. “Women in tech are evaluated on the basis of their personality, and men are evaluated on the basis of their skills,” Nguyen says. On a national level, Nguyen feels that President Donald Trump’s letter has a bad social and institutional impact in the places it would impact, even though she says it won’t affect her. Even in California, she recognizes the harmful messages received by transgender individuals. On a personal level, her experience of transitioning has revealed to her that there really is no significant difference between genders.